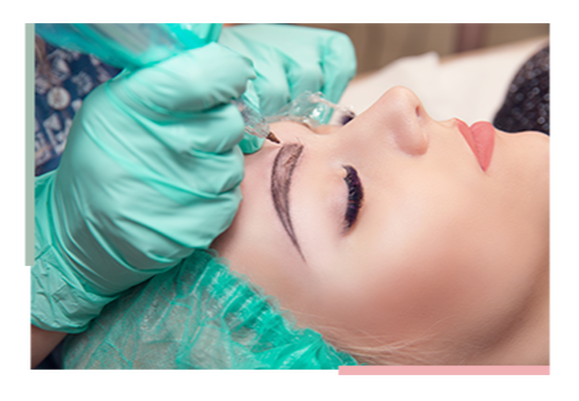 Microblading is a precise way to implant permanent color into the skin. Procedure is performed with a disposable hand tool and blade or a machine with disposable acupuncture size needles (depending on skin type) to create the most natural and realistic looking hair strokes. By using the finest hairline strokes, we can mimic individual hairs to give it a 3-D look. Amazing results for those with gaps, thin hair, dead follicles, sparse, uneven, alopecia, trichotillomania, and patchy eyebrows. The first step is design. Your eyebrows will be designed based on your bone structure, skin type, desired results and personal style. Detailed measurements are taken and your eyebrows are penciled on for your approval. The second step is Color. We will choose the most natural looking color for you. Our colors are custom blended & non-toxic. The third step is the process. Our equipment uses a single acupuncture size needle that gently vibrates on the dermal layers of the skin depositing pigment into the skin or a disposable hand tool that is used to implant pigment. A pigment is precisely applied in thin layers until the ideal color and shape are achieved creating a completely natural look. Several topical anesthetics and desensitizing products are used to make the procedure as pain-free as possible. During the 1st session, less is more. This session is about getting a nice base started, and the fine-tuning takes place in the touch up appointment. ​The last step is touch-up. You’ll return 6 - 8 weeks after your 1st session for a touch-up appointment to review the color and shape and make minor adjustments and perfection if needed to ensure that you have the look that you want to achieve. It takes about 2.5-3 hours per area. This includes administrative setup, eyebrow mapping and actual service. There is no downtime but it is important for you to follow the detailed after care routine for the best results.